1 Tetrapyle octacantha Müller; frontal view of specimen with third system of girdles complete, VS-R-64a, 1-3cm. K36/1, 300x. 2 Pylonium sp. ; frontal view, VS-R-81a, 1-3cm, W39/3, 300x. 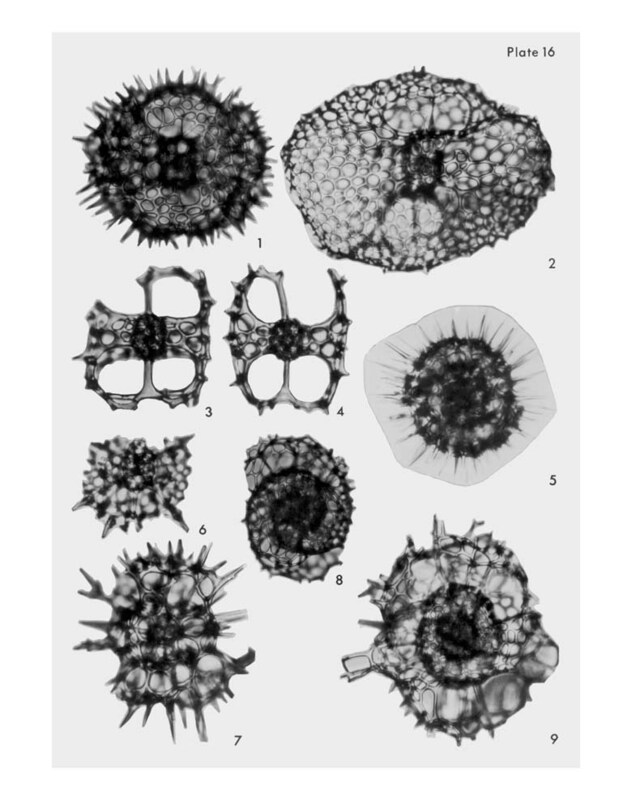 3-4 Octopyle stenozona Haeckel; 3, frontal view, VS-R-27b, 1-3cm, E33/4, 300x; 4, frontal view, VS-R-71a, 1-3cm, G19/4, 300x. 5-9 Phorticium pylonium (Haeckel) Cleve; 5, slightly oblique orientation illustrating the apparent double spiral, VS-R-71a, 1-3cm, C24/3, 300x; 6, frontal view of broken specimen illustrating the inner trizonal shell, VS-R-71a, 1-3cm, K43/2, 300x; 7, polar view VS-R-71a, 1-3cm, F22/0, 300x; 8, orientation illustrating the apparent double spiral arrangement of girdles, VS-R-60b, 3-5cm, Z38/0, 300x; 9, frontal view, VS-R-81a, 1-3cm, J39/1, 300x.